5 So also the tongue is a small member, yet it boasts of great things. How great a forest is set ablaze by such a small fire! 6 And the tongue is a fire, a world of unrighteousness. The tongue is set among our members, staining the whole body, setting on fire the entire course of life, and set on fire by hell. Here is a great little story I found online. "In the washroom of his London club, British newspaper publisher and politician William Beverbrook happened to meet Edward Heath, then a young member of Parliament, about whom Beverbrook had printed an insulting editorial a few days earlier. "My dear chap," said the publisher, embarrassed by the encounter. "I've been thinking it over, and I was wrong. Here and now, I wish to apologize." "Very well," grunted Heath. "But the next time, I wish you'd insult me in the washroom and apologize in your newspaper." Too often, we allow ourselves the liberty to say things for which we end up being sorry later. I hate it when that happens. And I don't believe the Lord is all that happy about it either. We really need to think before we speak! I heard one person once put it beautifully. 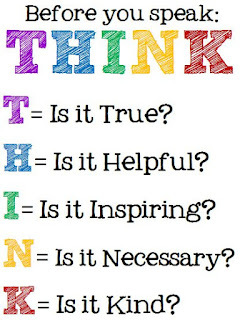 Before we say something let's "THINK"! T- is it True? H- is it Helpful? I- is it Inspiring? N- is it Necessary? K- is it Kind? THINK! If what we're about to say does not pass those tests, let's be careful and THINK if we should say it! God has great things for us to be doing. We must allow Him to refine us and prepare us for His work! Let's strive to think before we speak. Dear Lord, we pray today that you will guard our words. 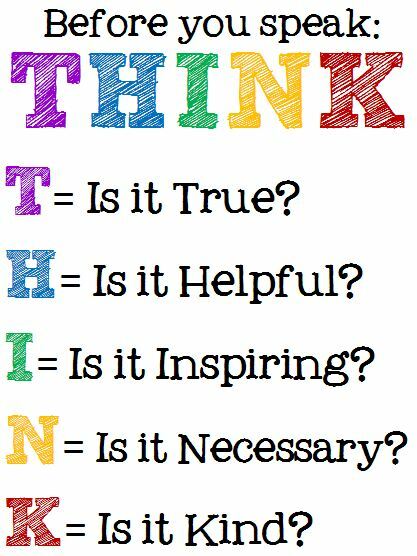 Help us to think before we say something. In the Name of Jesus, Amen.